They sneak into the hearts of their admirers on soft paws, let themselves get pet, purr pleasantly and enjoy the warming rays of the summer sun on their fur. As cute and cuddly as cats can be when they are feeling relaxed, they can be wild and crazy creatures when confronted with uncomfortable situations. 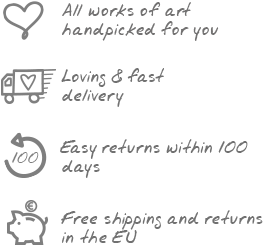 But don’t worry: You won’t have to deal with scratches from our handmade acrylic paintings! Take an example from the proud felines and let yourself be inspired by their elegance. A cat never pretends to be something it’s not to please others. It owns its personality and expresses its needs self-confidently and honestly - a statement for a strong character. There aren’t many other animals that are as complicated and full of contradictions as cats. Whether they sit in boxes or chase red laser pointers, playing kitties are the picture of exuberance and joyful life. On the other hand, house cats often spend hours and hours relaxing in their favourite napping spots or laying stock still, completely focused to take their next move on the hunt. These characteristics make them a popular art motif and make it possible to work with countless different interpretations and styles, from realism to industrial. No matter what kind of cats you like, you’ll find the right handmade painting at KunstLoft. show your spiritual side with a painting of faith in your bedroom. No matter what artwork you decide on, you can be sure that you are receiving a valuable art object that you can enjoy for a long time. We are so confident in our promise that we offer a 100 day return policy in case you are not completely satisfied. Playful or proud, catty or cuddly — cats are as multifaceted as life itself. These kitty characteristics have inspired countless artists and are the theme of many original artworks. We've carefully selected exclusive 3D frame art and acrylic paintings just for you.